The Holiday Season has begun….. Here is a terrific place to check out. http://www.etsy.com/shop/OutotheWoods. They have the most beautiful and unique items made from Wood. Everything from Bowls (one of my addictions) to Pens and everything in-between. You will also find a link on my home page under Zen Favorites. a morning of mixed emotions. Up early to get My Kid to work, write a Recipe for one of the Vendors and get organized. I doubled my budget for this trip. It’s the last til the middle of next May. I knew some of what I was going to get. The staples that I can store: Onions, Potatoes, Apples and the Jalapenos (String, Hang and let Dry). What a beautiful bounty 🙂 (pictured) Green Tomatoes (forgot to make Fried Green Tomatoes this Summer. Maybe this afternoon or over the Holiday), Tomatoes, Lots of Potatoes (they keep well and taste better than the Store bought. But, isn’t that true of all produce that is picked when it should be? ), Spring Onions (Scallions), Apples, Apples and more Apples (They store well. 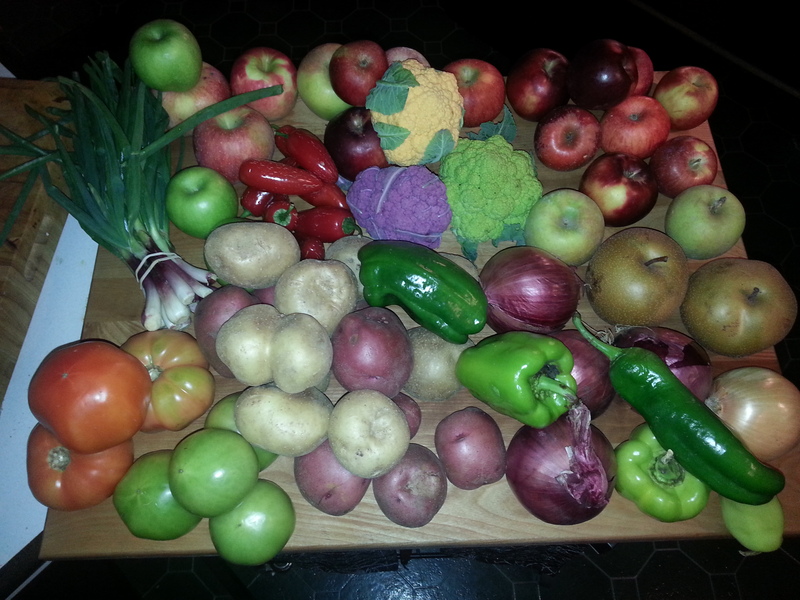 Check out my FYI ), Red Jalapenos (these I will string and dry), Cauliflower (Purple, Green and Orange), more Apples, a couple Asian Pears, Onions and Sweet Peppers. YUM! These gorgeous Carrots deserved their own pic. I was just finishing up a purchase and My Guy got a deal on these gorgeous Carrots. So, why not? We had one in a Salad last night. Oh how I wish there was smell-a- vision. When I started to grate it all you could smell was that sweet wonderful smell of Carrot. YUM! As we were leaving we realized that we were going to be running separately. We each had plans for the day and would meet up for Dinner late that evening. So, Hey, let’s grab a Pastry!!. I got an Almond Twist with a light, wonderful Apricot Glaze. My Guy got a classic Almond Croissant and we grabbed a Baguette for later. FYI: I have found a simple way to store Apples. I wrap each Apple in Newsprint and place in anything from a Box (if you can control the temperature where you’ll be storing them) to an Ice Chest. Even those Styrofoam dollar special kind. Place the wrapped Apples in the container of choice and close the container. If you are using an insulated container place in a cool, dry location (feel free to use your garage, if you have one). If using a box around 50-60 degrees (f) should do. Farewell to the Farmer’s Market…it was inspirational this past season for my creativity in my room 🙂 Thank you to all the wonderful Vendors. I’ll be back again and again. BTW – This seasons slide show is in the works, and don’t forget to check out your own local Farmer’s Markets. You can check local Farmer’s Market locations at http://www.eatlocalgrown.com. You can find the link on my home page, or you can just copy and paste from here. I am angry and disgusted with some things I’ve read. I am going to do more research. From what I have read this is happening in the state where I live. You will now need a Drs. written note to let your child eat a brown bag lunch at school. I have absolutely nothing polite to say about this. I need to take a breath and see if I can calm myself. I will be writing more on this. The what if’s are freaking me out. What if your child is allergic to Peanuts? What if your child is Diabetic? What if your child has Celiac Disease? What if your child has Lupus? What if????? Here is an example: a child brings a home-made packed lunch to school. The school administration deems it not complete. They demand a name brand chemical and dye filled cracker be added to make the lunch complete….really???? Til next time….please feel free to share your thoughts. So what do you eat…. when you have the house to yourself???? Here are a couple of things I through together for myself this week. Baked Purple Potato with leftover Grilled Veggies: Zucchini, Scallion and Tomato. Baked Purple Potato with Salmon, Scallion and White Balsamic Vinegar.